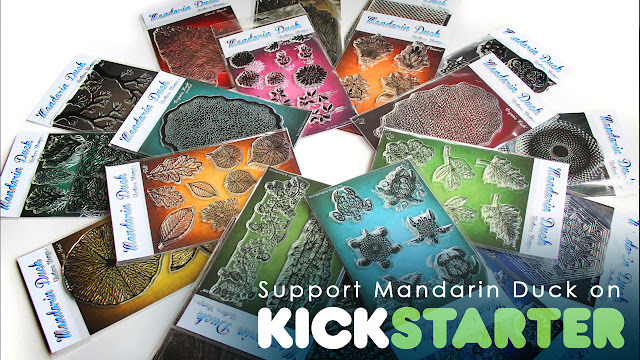 Today I would like to share with you my Mandarin Duck Texture Stamps (c) 2nd collection. It is a very exciting and important time of my life, as this is the biggest sole project I have ever done so far regarding the branded products I have ever made. I don't want to be talking a lot today, as what I would like to show you speaks for itself completely! It's a visual thing, not verbal! :) But few more words just before that! So, for those who missed it all, I have a KICKSTARTER PROJECT set up to support the funding of my 2nd stamp collection. Production is a complicated and expensive thing, so I need your support and I have prepared a lot of rewards for my backers and supporters. So all you need to do is CLICK HERE and check out the project and the reward system on the right hand side of the page. Then, if you are willing to give a little helping hand - click on BACK THIS PROJECT and you will be offered some options to choose from. We have 27 days left and during the first 3 days we accumulated over 16% of the total amount with the help of 36 backers! SO EXCITING!!! If this preview isn't working, CLICK HERE!